A responsive web design is based on conditional CSS. With conditional CSS, different styles kick in, when the browser is made a certain size. 1. Name a class for the divs in your html that you want to be responsive. The class name should end with “mobile-collapse”. In this instance, you should name the columns in this class. 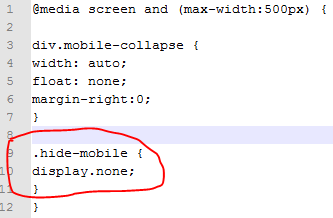 Now when the website is reduced to a size less then 500px in width, all the elements within the div classes ending with “mobile-collapse” should become styled with auto width, no float and a right margin of 0. 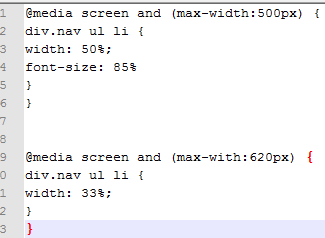 The “@media screen” tells the browser that this is a Media Query and that it should be called when the browser is a certain width. Hopefully this explains the concept behind responsive design. Different styles will be called/initiated when the browser window is a certain size. I used the custom css option to make my free wordpress theme responsive on this site for Online Personal Training.